Because the aorta is the body's main supplier of blood, a ruptured abdominal aortic aneurysm can cause life-threatening bleeding. Once an abdominal aortic aneurysm is found, doctors will closely monitor it so that surgery can be planned if it's necessary. Emergency surgery for a ruptured abdominal aortic aneurysm can be risky. - Tobacco use. Cigarette smoking and other forms of tobacco use appear to increase your risk of aortic aneurysms. Smoking can be damaging to the aorta and weaken the aorta's walls. - Hardening of the arteries (atherosclerosis). Atherosclerosis occurs when fat and other substances build up on the lining of a blood vessel. This condition may increase your risk of an aneurysm. - High blood pressure. High blood pressure can increase your risk of abdominal aortic aneurysms as it can damage and weaken the aorta's walls. - Blood vessel diseases in the aorta. Abdominal aortic aneurysms can be caused by diseases that cause blood vessels to become inflamed. - Infection in the aorta. Infections, such as a bacterial or fungal infection, may rarely cause abdominal aortic aneurysms. - Trauma. Trauma, such as being in a car accident, can cause abdominal aortic aneurysms. - Heredity. In some cases, abdominal aortic aneurysms could be hereditary. There isn't enough evidence to determine whether women ages 65 to 75 who have ever smoked cigarettes or have a family history of abdominal aortic aneurysm would benefit from abdominal aortic aneurysm screening. Ask your doctor if you need to have an ultrasound screening based on your risk factors. Women who have never smoked generally don't need to be screened for the condition. - Age. 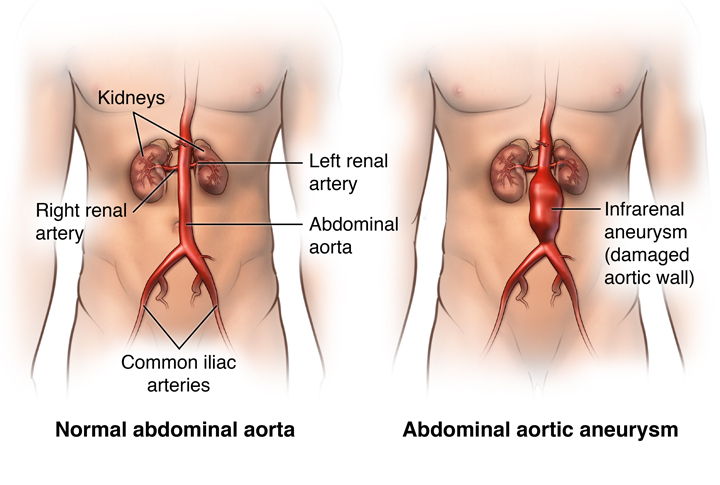 Abdominal aortic aneurysms occur most often in people age 65 and older. - Tobacco use. Tobacco use is a strong risk factor for the development of an abdominal aortic aneurysm and a higher risk of rupture. The longer you've smoked or chewed tobacco and the more cigarettes you smoked per day, the greater your risk. - Being male. Men develop abdominal aortic aneurysms much more often than women do. - Being white. People who are white are at higher risk of abdominal aortic aneurysms. - Family history. People who have a family history of abdominal aortic aneurysms are at increased risk of having the condition. - Atherosclerosis. Atherosclerosis — the buildup of fat and other substances that can damage the lining of a blood vessel — increases your risk of an aneurysm. - Other aneurysms. 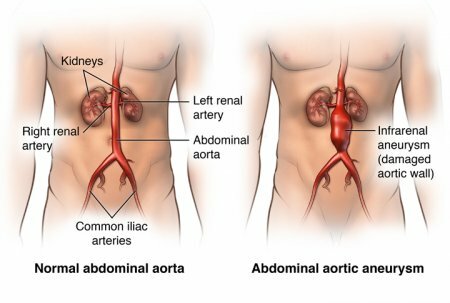 People who have an aneurysm in another large blood vessel, such as the artery behind the knee or the thoracic aorta in the chest, may have a higher risk of developing an abdominal aortic aneurysm. - High blood pressure. High blood pressure may increase your risk of developing an abdominal aortic aneurysm.